Posted October 28, 2013 by backupwp & filed under Guest Post. I imagine more or less all of the world’s best suspense story authors would love to see their work on the silver screen. It’s the ultimate ego boost, revealing your work to an even wider and more mainstream audience. After all, difficult as it is to imagine, some people never pick up a book. They do newspapers, TV and movies, and that’s about it. 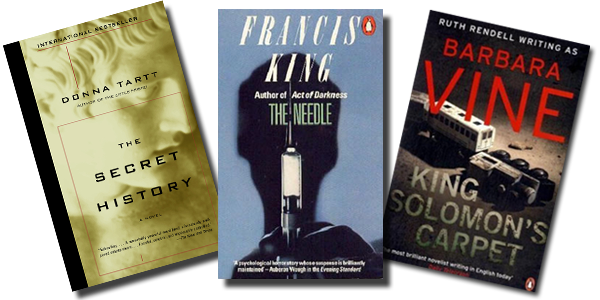 Idly daydreaming about the top three crime novels I’d most like to see made into films, I came up with these. I read The Secret History every year or so. It’s one of those rare crime novels that just keeps on giving. The characters are so beautifully drawn right from the outset, each unique, each eccentric and unusual, and each flawed, which is essential as far as I’m concerned. There’s nothing duller and less convincing than shiny, perfect goodies pitting their wits against one-dimensional black-hatted, black hearted baddies. People aren’t that shallow. We’re a muddle of grey tones, which is what makes us so fascinating. There’s enough actual action in The Secret History to make it an excellent film, as well as enough psychological tension to tie you in emotional knots. The setting is perfect, providing a curiously airless, unnervingly intimate and unpleasantly tense backdrop for the plot. A few of the characters are downright dislikeable, some are just weak, some are intellectual snobs, others teeter on the edge of mental illness. And the main characters are all pretty obsessive, which is the reason why things ultimately go so badly wrong. The Secret History is set at a fictional college and concerns a close-knit group of six students and their professor of classics. The students embark upon a secretive plan to stage a bacchanal. The narrator reflects on a variety of circumstances that lead ultimately to murder within the group. The murder, the location and the perpetrators are revealed in the opening pages, upending the familiar framework and accepted conventions of the murder mystery genre. Critic A.O. Scott labelled it “a murder mystery in reverse. The author seems like a very interesting woman. Here’s a link to a recent interview with Donna Tartt, released on the Salon website on October 23rd 2013. And here’s a BBC Radio 4 piece on the author, The Secret History of Donna Tartt By Mark Coles, Arts Correspondent. 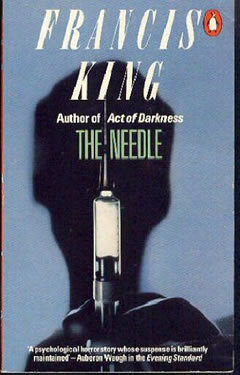 Another of my personal best thriller books is The Needle by Francis King, written way back in 1975. Of all the crime novels I’ve read over the years, this one creeps me out the most. I can see the movie in my head, starring the hopeless, pathetic, loyal Lorna and the evil, weak, greedy, indulgent, selfish, child-molesting Bob. The utter lack of glamour and brightness and vigour. The dragging tedium of small lives lived in ugliness, misery and obscurity. The casual cruelty, the perpetual gloom, the snobbery, the dirt, the despair. The whole thing is so horrid I reckon it’d be best filmed in black and white. With almost eighty crime novels and thriller books under her belt, Rendell is a shining star in the British thriller firmament, with her intricate, eclectic plots, real-life settings and eccentric characters. I can see the movie clearly, mostly set deep in the London Underground rail network or, as we call it in Limey-land, The Tube. If you’ve travelled by tube train you’ll know the score. They do their best to keep things cheery but the air in the tunnels tastes like it’s been circulating through thousands of people’s lungs for a hundred years, uncannily warm in the wrong sort of way, heated by thick darkness and engine oil instead of sunshine. The tunnels themselves are pitch black and lined with hundreds of filthy cables and wires, dark upon dark upon dark. It smells like unwrapped mummies (not that I’ve ever unwrapped a mummy!). And while I don’t want to spoil the plot for you, the scene on the roof of the train as it hurtles downhill at awful, rackety speed deep under the earth, is genuinely horrifying. Now that’s what I call a great movie scene… or it looks that way inside my head. Jarvis Stringer is a student of the London Tube and its history and of underground trains worldwide. In order to finance his hobby and be able to travel to distant lands to inspect the underground systems in other parts of the world, he lets rooms in an old disused school building he has inherited which is close to the tube tracks in West Hampstead. There, a group of misfits and weirdos, including a squatter, gather whose dreams of the good life have time and again been shattered as they are constantly victimized by society. There is 24 year-old Alice, an aspiring musician who leaves her husband and new-born baby only to end up busking in various stations in central London. There is Tom, who, after an accident, drops out of music school and is reduced to busking as well but who dreams of one day starting his own business. There is unemployed Tina, whose promiscuity landed her with two children whom she does not take care of in the way her mother thinks she ought to. There is Jed, who volunteers as a vigilante and who, disappointed by humans, lavishes all his love on the hawk he has acquired and which he keeps in the house. And there is Axel, an enigmatic man who regularly travels on the tube in the company of a man disguised as a bear and who is planning something illegal. Cecilia and Daphne, two old ladies living in the neighbourhood, serve as a foil to this ill-assorted group. It is Cecilia in particular who does not understand how young people such as her daughter Tina can be utterly devoid of morals. She is shocked to learn that her 10 year-old grandson enjoys riding on the roof of cars as they go through deep-level tunnels. While travelling on the tube herself, her handbag containing her credit cards is stolen, and she suffers a stroke in one of the packed cars. There’s a pattern here. I see the movie of this uniquely strange crime fiction book as another supremely dark affair. Like the other two thriller books I’ve chosen, there isn’t a great deal of violence per se. So the violence, when it occurs, is particularly shocking. It’s more psychological than physical. It eats away at your peace of mind, ruins your sleep, makes you feel emotionally soiled. There’s no need for technicolor, car chases, gun fights, dramatic soundtracks. The discomfort I feel reading them is down to the constant, unrelenting low-level tension that oozes stickily from all three. What great suspense story do you think would make a brilliant film? There’s a vast choice of crime fiction, suspense stories and thriller books available. Which of your best crime novels do you think would make the most hair raising movie, and why?